Try this juicy and tender stove-top steak and sauce recipe. 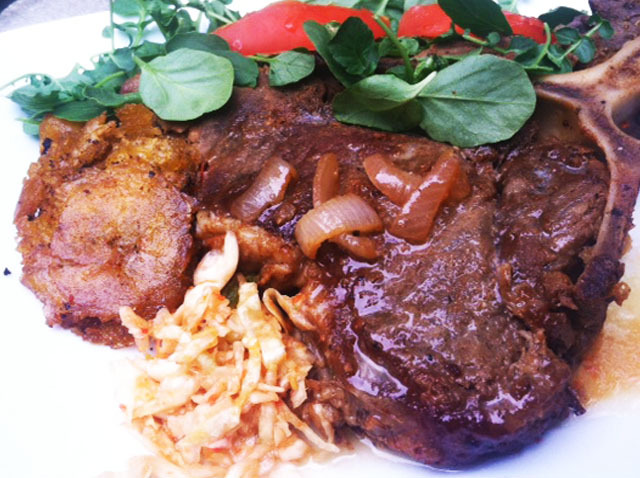 Have it with du riz cole, fried plantains, and watercress salad. yum! Clean the meat and marinate with epis, garlic powder, seasoning salt, chicken bouillon cubes, and seasoning salt for at least an hour. In a heavy skillet, heat a 1/2 cup of oil. Add in the seasoned meat and cover over high heat. Pour in some water and add the cloves. Cover and let the steak cook for about an hour. Remove the lid and cook the meat uncovered. As the water evaporates, simmer the meat with 3-4 tsp of water. Flip each side until nicely browned. Repeat 2-3 times. Cook until meat is tender and juicy. Set aside the meat. Using the same pot that cooked the meat, add tomato paste over medium heat. Pour in a cup of water, add the diced onions, and let it simmer until the onion is translucent. Remove from heat and drizzle the sauce over the steak. Garnish the steak with onions and red pepper.